This week, Coalition for the Homeless released a white paper entitled “Housing DisConnect: Fact-Checking Mayor de Blasio’s Claims on Affordable Housing and Homelessness.” The report illustrates how Mayor de Blasio’s current housing plan falls far short of meeting the scale of the city’s tragic homelessness crisis, fact-checks some of the Mayor’s false claims regarding homelessness and his affordable housing plan, and highlights the steps the Mayor needs to take to make a meaningful and historic reduction in record homelessness. Specifically, Mayor de Blasio must listen to the House Our Future NY Campaign and dedicate 10 percent of his 300,000-unit affordable housing plan for homeless New Yorkers – 30,000 units, including 24,000 units to be created through new construction. 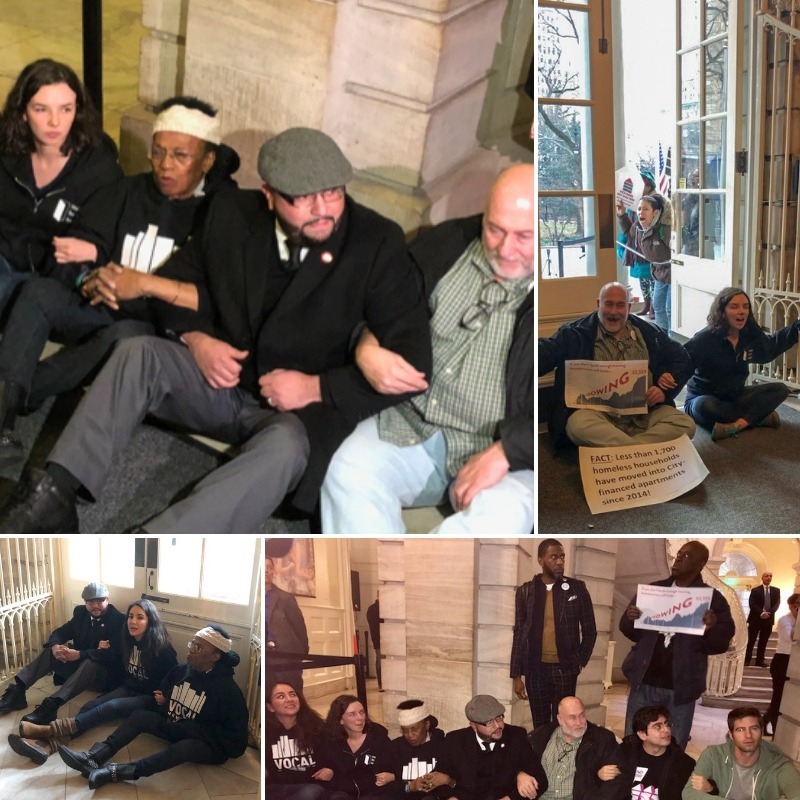 To coincide with the report’s release, members of the House Our Future NY Campaign staged a sit-in at City Hall on Tuesday to highlight the urgency of the campaign and publicly correct Mayor de Blasio’s inaccurate statements. Among those participating in the sit-in were Nathylin Flowers Adesegun, a currently homeless woman who has repeatedly urged Mayor de Blasio to agree to the House Our Future NY Campaign at his gym and on the radio, and Council Member Rafael Salamanca Jr., whose Intro. 1211 would require developers receiving City financial assistance for housing development projects to set aside at least 15 percent of units for homeless individuals and families. The action received press coverage in the Daily News, NBC, News 12, Patch, and other outlets. The mayor says his Housing New York 2.0 plan addresses the affordable housing crisis for everyone, and adding more homeless units would take access to housing away from other New Yorkers who need it. But here’s the thing: New York City’s affordability crisis disparately impacts those with the lowest incomes. There is no shortage of private market apartments affordable to higher-income households: the vacancy rate for units renting above $2,500 per month is in fact a whopping 8.74 percent, while the vacancy rate for apartments renting for less than $800 per month is only about 1 percent. Yet a full 20 percent of the mayor’s housing plan is for households making between $70,000 and $142,000 annually, at rents ranging from $1,700 to $3,500 per month, while at the same time dedicating a mere 5 percent to help homeless New Yorkers. Fully 10 percent of the apartments created through the mayor’s plan will have rents at or above $2,500 per month, a level at which there is currently a glut of vacant units. The mayor’s housing plan should target its help for those who need it most. The mayor says his housing plan is just a small part of what the city is doing to address homelessness. That much is true, but it is not a fact to be proud of. Mayor de Blasio plans to build only 200 new apartments per year for homeless New Yorkers out of the 10,500 apartments per year to be constructed between now and 2026. Other programs implemented by the city that serve homeless people with disabilities, help pay off rent arrears, or provide subsidies for market-rate apartments can’t meaningfully reduce homelessness unless the city also sets aside far more newly-constructed housing for the homeless. The numbers bear this out: homelessness continues at record levels five years into de Blasio’s New York, with more than 63,500 people sleeping in city shelters each night, including over 23,000 children. They are paying an extraordinary price for bad policy, as is our city as a whole. And finally, the mayor says that adding more homeless housing to his plan is not financially feasible. But the House Our Future NY Campaign is urging Mayor de Blasio to designate just 10 percent of his overall housing plan, including 20 percent of the new construction target, for homeless New Yorkers: 30,000 units overall, with 24,000 to be created through new construction. Funds the mayor has already committed to the plan, including over $1.3 billion in city funds each year for the next eight years, show that the mayor has the resources to significantly reduce homelessness. He simply lacks the will. The mayor’s obstinacy in the face of record homelessness and an ongoing housing crisis for low-income New Yorkers belies his professed values as a progressive leader. Without swift course correction, this wrong-headed approach will lock the City of New York in a state of ever-expanding homelessness for the foreseeable future. The only way out is with bold solutions. Mayor de Blasio must immediately dedicate 10 percent of his housing plan, including 20 percent of all new construction, to house homeless New Yorkers. Tens of thousands of our neighbors languishing in shelters and on the streets – indeed all New Yorkers – deserve a housing plan that offers a responsive and robust answer to record homelessness, not more equivocation in the false promise of fairness for all.